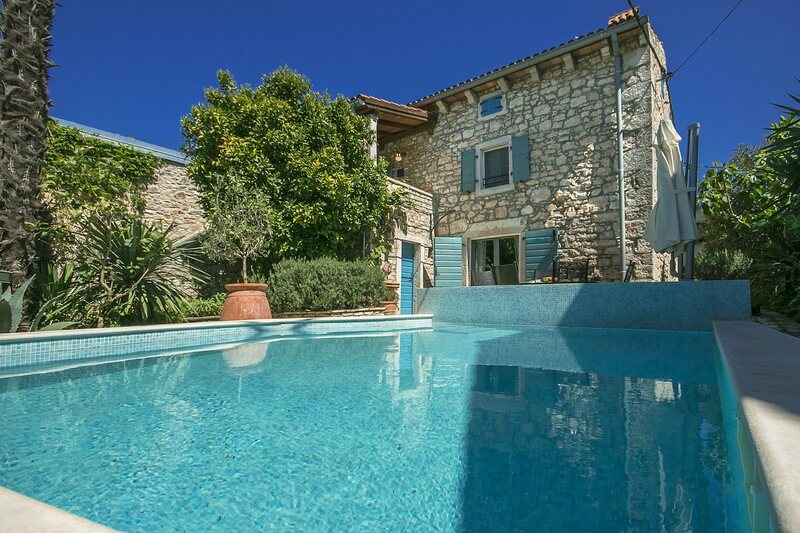 The Villa Annette is a completely renovated traditional Istrian semi-detached stone house located in the small village Musalez, just 3 km from Porec and 4 km from its beaches. The house has been built in the year 1900 and renovated in the year 2002/2013. During the reconstruction of this villa, the architect has paid great attention in preserving the traditional elements of the ancient Istrian stone house, but at the same time in offering a higher level of comfort to its guests. The interior is a successful combination of traditional and modern materials with lots of space and light, assuring to its guests a really outstanding holiday. On the approximately 300 sqm enclosed yard there’s a private swimming pool, terrace with table and chairs for 6 persons covered by a large parasol, barbecue, garden with Mediterranean plants and parking place for two cars. The Villa is for 4-6 persons with approximately 160 sqm on three floors. At the ground floor there’s a spacious living area with fully equipped kitchen, large dining table with chairs, two couches, flat screen TV set, antique writing desk and a fireplace – all in one space, bathroom/toilet with steam bath and a Finnish sauna. At the 1st floor there’s a nice living room with one armchair, two couches of which one can be used as a one-person’s additional bed, Hi-Fi and flat screen TV set, small kitchenette with oven and stove, one two-person’s bedroom with premium box spring bed, terrace (“baladur”) with table and chairs and a bathroom/toilet with shower and an additional bathtub with whirlpool. At the second floor (attic) there are two two-person’s bedrooms with french bed each. From these bedrooms you have panoramic view at the sea and the istrian landscape. Public parking places at 50 m.
Es ist ein wunderschönes Haus mit einer großzügigen Ausstattung . Man findet sich sehr schnell zurecht .und fühlt sich dort sehr wohl . Leider funktionierte der Backofen in der ersten Etage nicht . Im Erdgeschoss ist die Fläche des Ceranfeldes komplett gerissen . Das Restaurant was 300 m entfernt ist - gibt es nicht mehr . Wunderschöne Villa, perfekte Ausstattung. Sehr nette Betreuung vor Ort! Ein Auto ist unbedingt notwendig.